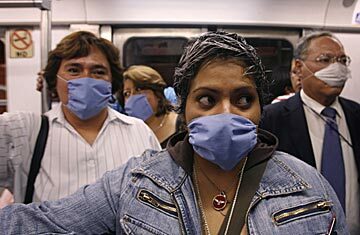 Subway riders in Mexico City wear surgical masks to avoid catching the flu, Friday, April 24. Will Swine Flu Panic Spread Beyond Mexico? Concern that the world could be on the brink of the first influenza pandemic in more than 40 years escalated Sunday as France, Hong Kong, New Zealand and Spain reported potential new cases in which people had been infected with swine flu and Canada confirmed several new cases. In the U.S., where 20 such infections have been confirmed, federal health officials declared a public-health emergency and are preparing to distribute to state and local agenciesa quarter of the country's 50 million-dose stockpile of antiviral drugs. Meanwhile, in hard-hit Mexico, where more than 80 people have died from what is believed to be swine flu, the government closed all public schools and canceled hundreds of public events in Mexico City. Health officials in Washington were quick to point out Sunday that none of the 20 cases identified in the U.S. so far has been fatal; all but one of the victims has recovered without needing to be hospitalized. Officials also noted that only one American has been infected so far who had not recently traveled to Mexico  a woman in Kansas got sick after her husband returned from a business trip in that country, where he became ill  but that could change as more intensive disease surveillance begins. "As we continue to look for more cases, I expect we're going to find them," said acting Centers for Disease Control (CDC) director Richard Besser. That is in contrast to the more extreme actions of some other governments, including Hong Kong, where officials on Sunday urged residents to avoid going to Mexico. Hong Kong officials also ordered the immediate detention in a hospital of anyone who arrives with a fever above 100.4 F, respiratory symptoms and a history of traveling over the past seven days to a city with a confirmed case of swine flu infection. But Washington officials Sunday did their best not to overstate the situation and emphasized that their response wasn't out of the ordinary. "I wish we could call it declaration of emergency preparedness, because that's really what it is in this context," said Secretary of Homeland Security Janet Napolitano. "We're preparing in an environment where we really don't know ultimately what the size or seriousness of this outbreak is going to be." See the top 10 medical breakthroughs of 2008.